1) The Conor Pass Slides; 2) Brendan Begley’s Polkas; 3) Thoughts Of Slea Head; 4) Travers Jig & Reel; 5) Dingle Harbour Set; 6) Beauty deas an Oileáin; 7) The Blasket Island Jigs; 8) From Dingle To Donegal; 9) Dónal Óg; 10) Muirioch Polkas; 11) A Mist Covered Brandon; 12) Out On The Ocean; 13) Reels: A Tribute to John Smedley; 14) The Mad Jigs; 15) Dawn Magic Of Ventry; 16) Funghi's Jig. 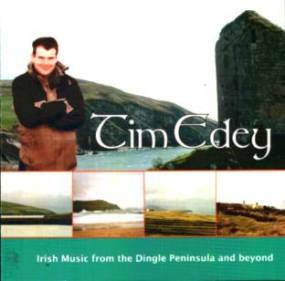 Though he comes from the coastal resort of Broadstairs in Kent, about as far east of Dingle as it’s possible to go within the islands of Ireland and Great Britain, the multi-instrumentalist Tim Edey’s debut solo album truly manages to encapsulate an authentic Kerry sound, reflecting the amount of time the musician has spent in the region. On Irish Music from the Dingle Peninsula and Beyond, which was recorded over a six-year period, Edey plays a variety of lead instruments including C/C# accordion, D/G melodeon, whistle and banjo, and accompanies himself on keyboards, guitars, bass, percussion and piano, thanks to his own in-house studio wizardry. Tim’s opening track is a fairly well-known trio of slides, given here the title The Conor Pass, introduced with a subtle reggae-style accompaniment on bass, guitars and percussion, which soon broadens out to include wailing guitars. Edey’s C/C# accordion remains dominant throughout the tunes and provides ample evidence of his virtuosity. Next comes a set of tunes entitled Brendan Begley’s Polkas, in which Edey’s high-speed mastery of the D/G melodeon receives accompaniment from nylon-strung guitar (with bass and keyboards drifting in later) while the following track, the traditional clan march Thoughts of Slea Head, reminds us of Tim’s dexterous abilities on said guitar. In Travers Jig and Reel the jig starts off at a slow deliberate pace, allowing Edey to populate it with a full range of triplets and long strong notes displaying the full dynamics of the C/C# box, then taking a short breather before launching headlong into another steadily paced 4/4 reel version of the tune, again exquisitely decorated with triplets and other ornaments accentuating the natural rhythm of the tune. Edey plays more of his aces on the Dingle Harbour Hornpipes set with occasional ‘octaving’ - playing a note with its counterpart one octave apart - interspersed with long decorative runs and arpeggios on these two cheeky hornpipes, setting a chunky pace before galloping into The Foxhunter’s Reel, complete with machinegun like staccatos on the third part and occasional long high notes reminiscent of a hunting horn. On Beauty deas an Oileáin we are again allowed to bask in the warmth of Edey’s superlative guitar work in his treatment of this beautiful but strange slow air. Powerful D/G melodeon-playing on the Blasket Island set of three jigs with minimal accompaniment enables Edey’s playing to make an undeniable statement of authority. The Dingle To Donegal set, first recorded by Altan’s Dermot Byrne, is revisited and given the full Edey treatment to let the tunes, a highland (the Donegal fiddlers’ slightly quicker adaptation of the strathspey form) and reel, shine again. Dónal Óg, (young Daniel), believed to be an eighth-century Irish love song, is here played beautifully yet sparsely as a lament, on D/G melodeon. Muirioch, a tiny hamlet in the west of the Dingle peninsula, provides the name for the next set of polkas, The Muirioch Polkas, expertly handled here on C/C# box and guitars. A tidy version of the jig The Mist Covered Mountain, composed by Junior Crehan, is followed by the reel The Maids of Mount Cisco (and here we witness the well-documented talent for Irish tunes to go by many names, as Edey has it as the Maids of Monsisco. Mount Kisco, however, is a town just north of New York City and is the alleged source of the tune name). Edey’s version here ends in jazzy style, which will appeal to aficionados of the more experimental side of Irish music. More sweet mellow guitar work is to be heard on the Out on the Ocean set of jigs, but the mellow feel belies the underlying intricacy of Edey’s guitar. Edey’s next track, Reels, a tribute to John Smedley has him going so much to town such that they overflow with harmonies, triplets and melodic invention, with a Joe Derrane (or is that deranged?) feel to the playing. The Mad Jigs set starts off with some clean playing but quickly this becomes highly ornamented, in the Edey fashion. The first tune in the Dawn Magic of Ventry set offers an almost psychedelic feel, but the succeeding polka succeeds in waking us without breaking the magical spell. Funghi’s jig is one of Edey’s own compositions, and though it may sound like some tunes you’ve heard before, this does not detract from the originality of the piece. It nicely rounds off a highly original album bristling with innovative treatments and arrangements of tunes many of which indeed you’re well likely to hear on a visit to the Dingle peninsula. This is an original review by Danny Mackay for TIMR, printed here with the kind permission of the author.